Parkers Cottages offer comfortable and affordable bed and breakfast accommodation in St. Lucia Estuary, South Africa, gateway to the Greater St Lucia Wetland Park (now iSimangaliso Wetland Park). Situated close to the tropical forest, this beautiful Nature Reserve is a UNESCO Natural World Heritage Site and an ideal place from which to explore the Elephant Coast of KwaZulu-Natal in the heart of Zululand, South Africa. The iSimangaliso Wetland Park remains the most ecologically and historically diverse park in South Africa. The fully en suite guest cottages each have two bedrooms, air conditioning, secure parking and are fully serviced. Set within a colourful, tropical garden, there is a private pool and braai area available for guests. A scrumptious breakfast is included and families are welcome. St. Lucia is famous for its host of activities which include Big Five game safaris and night drives in the St Lucia and Hluhluwe iMfolozi Game Reserves, birding, seasonal turtle tours and boat-based whale watching, hippo and crocodile boat cruises, cultural tours and activities, horse riding in the bush or on the beach, walking trails and fishing. There are 28 kms of pristine beach and water-based activities, including snorkelling and scuba-diving, in the warm Indian Ocean. For those interested in eco-tourism, this UNESCO Natural World Heritage Site consists of five separate ecosystems to explore, all of which are intertwined so it may take several days to learn about this fragile environment. St Lucia is the ideal destination for a fun family holiday or a romantic break and with so much to do, you'll need at least a week! Craig, Bonita, Nomsa, Jabu and Elias Welcomes you to Parkers Cottages! A wide variety of exciting game drives. With its diverse eco-systems, it is renowned for its huge variety of flora and fauna. In case you’re wondering what to do in St. Lucia, these are just a few of the activities available. 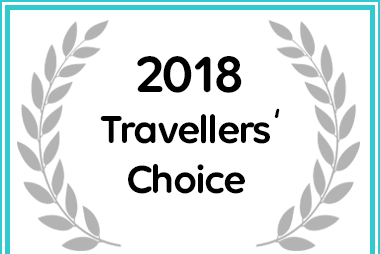 Afristay awarded Parkers Cottages in St Lucia With a 2018 Travellers' Choice Award. Parkers Cottages is an Afristay Valued Member.